This autumn, take a trip up north and savour the unique tastes and sensations of the Northern Territory. There is plenty of bush tucker to be found throughout the Top End if you know where to look. Here, Indigenous people have lived off the land for thousands of years, sourcing food and medicines from the earth, the sea and the sky. If you are interested in collecting or hunting bush tucker, it is absolutely vital that you obtain approval or permission. Above all, when collecting bush tucker, make sure you follow any restrictions, do not collect protected species, and that you are respectful of the environment. Better yet, take a guided tour to learn about the hidden world of bush food from the experts. What bush tucker will you find? Boasting the highest concentration of vitamin C out of all the fruits in the world – more than 50 times the concentration of an orange – the Kakadu plum is a bush tucker superfood. This delightful green fruit is about the size of an olive, and has a small seed inside. It has a sweet, tart flavour, and while it’s a great snack, it can also be made into an excellent chutney or sauce that goes perfectly with white meat and fish. The bush apple has a crunchy, crispy texture and a sweet, sour taste – after one bite, it will be obvious where the bush apple gets its name from! This fruit grows broadly throughout the Top End in open forest. The fruit grows in dense clusters and features distinctive ribs. Growing from October to March, the fruit is at its ripest when it develops fine cracks in the skin and is bright red in colour. Pandanus trees overhanging a billabong is an iconic Top End sight. Not only are they spectacular and intriguing plants, but the pandanus nuts for great bush tucker, too. Prevalent throughout the Top End – mostly near wet earth by places such as rivers, lakes, wetlands and coastal areas – it’s not hard to find a pandanus tree. The nuts cluster in bunches of five to seven, and when they are ripe, they are a bright orange to red, with a light woody, fruity scent. 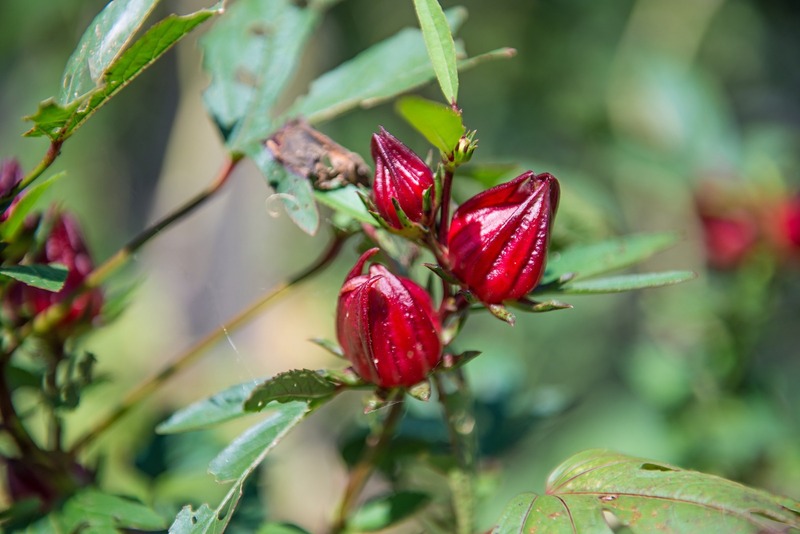 The vibrant red rosella plant – or wild hibiscus, as it is otherwise known – is a stunning burst of colour in the bush. It grows in leafy bushes, with blood-red ‘fruits’ – which are actually the fleshy calyx (the protective ‘cup’ that surrounds a flower bud). Inside the calyces is a seed – not edible, but useful for making rosella jam due to its high pectin content.